Here we are again! This time with the list of the main cyber attacks occurred in the second fortnight of November (part I here). 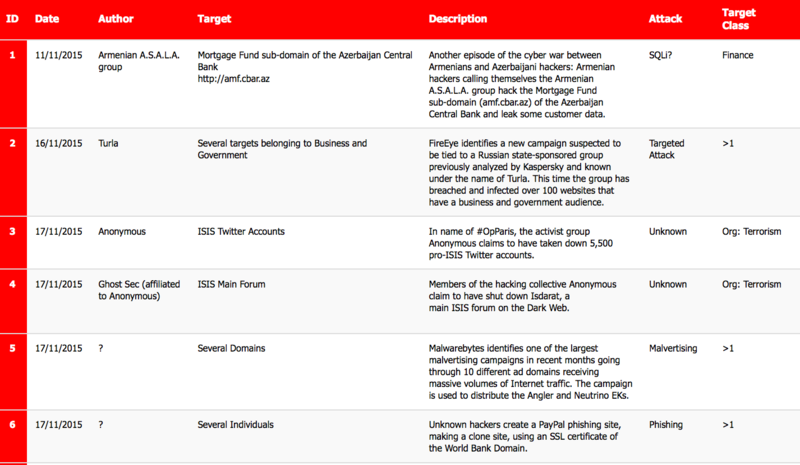 Landesk, Pearson VUE, Starwood Hotel, and Invest Bank are the most noticeable targets for this fortnight (along with three unnamed Greek banks blackmailed by the DDoS gang Armada Collective). However, this timeline is clearly characterized by hacktivism thanks to the multiple actions executed by members of the Anonymous collective (even if driven by different motivations). The Anonymous kicked off their campaign against ISIS-related social account profiles (in name of OpISIS), and also hit other primary targets such as: Japan’s Health, Labor and Welfare Ministry, several Iceland Government Websites (OpWHales), the website of United Nations Climate Change and the website of Taiwan Police (OpSingleGateway). But the timeline also offers several cases of state-sponsored attacks, such as a new version of the Turla and Dark Seoul campaigns, a new threat actor dubbed Strontium targeting government bodies, diplomatic, and military institutions in NATO countries and some parts of Eastern Europe, and a new undetectable RAT dubbed GlassRAT focused on Chinese nationals in commercial organizations. 13 20/11/2015 ? Starwood Hotels & Resorts Starwood Hotels & Resorts Worldwide Inc says that payment systems at 54 of its hotels in North America had been infected with a malware designed to collect payment card data. 22 23/11/2015 ? Gigi Hadid Gigi Hadid admits to be blackmailed by a group of hackers who claim they're ready to leak private content from her iPhone unless she pays up. 35 30/11/2015 Armada Collective Three Unnamed Greek Banks Reuters reveals that hackers belonging to the Armada Collective have staged cyber-attacks on three Greek banks and demanded a ransom in bitcoins, to stop their disruption.